On the 7th Day of Christmas Hertoolbelt sent to you Rudolph the White Stag Reindeer, People nativity scene, st-a-ck-ed snowman, peppermint candy, 3-tier felt tree, sweater owl, and mini-mittens on a little wooden tree. The white stag has been quite the rage for a while now. It is about time that Rudolph embraces the new style!!! This ornament is a very simple DIY, but it’s kind of a fun twist on good ol’ Rudolph. Print and cut out Rudolph the white stag ornament on cardstock. Cut Rudolph out from white/cream felt. Cut 2 ovals from red felt. blanket stitch Rudolph onto the top circle in a corresponding floss color. 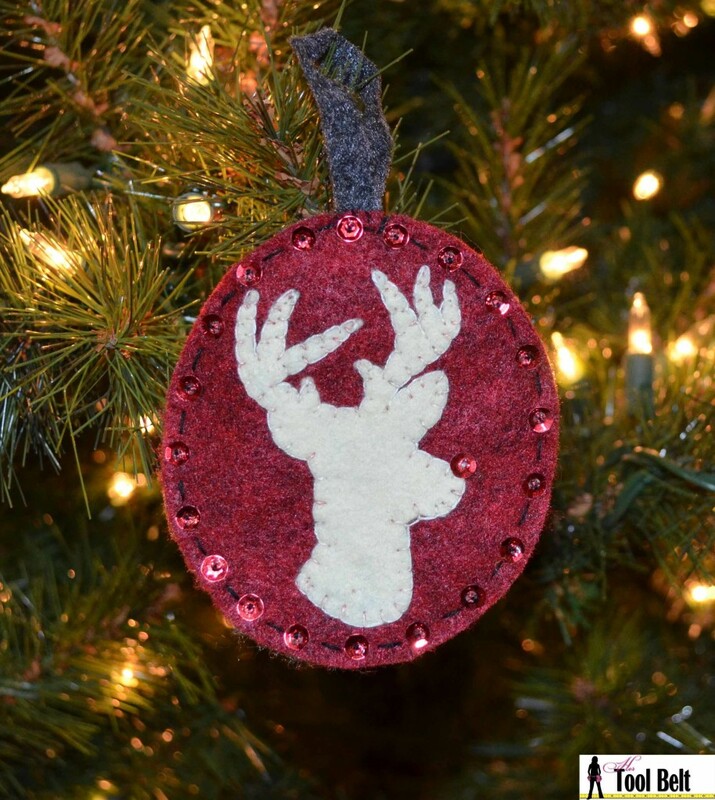 Use a sequin, red pom pom, or red felt dot to make Rudolph’s nose. 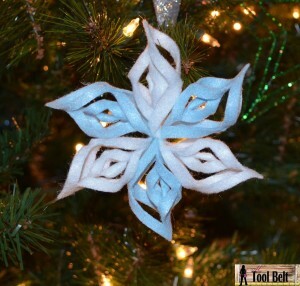 Cut a 1/4″ x 4″ strip of felt or ribbon. Fold it in half to make a loop. Stitch together the felt ovals, stitching the hanging loop into the seam. (I added a little bling with sequins in the outer stitching.) Enjoy your homemade Christmas Tree ornament.